Fabrizio Moreira once said, “The American Dream is that any man or woman, despite his or her background, can change their circumstances and rise high as they are willing to work.” Five year old Rocio had not yet come to understand that in her young age moving to America, but little did she know she would become a living example of it. She flew from Mexico City, where she was born, with her mother, father, grandmother, and younger brother to the exciting streets of New York. They lived in a modest apartment as illegal immigrants, where her grandmother took care of her for the most part. Rocio’s mother was an American Citizen, but at the time Rocio understood that she needed “something” to stay in America. That something was her birth certificate that took about a year to get. She did not understand the whole process of becoming legal, but knew she had to do it. She was not forced to attend any classes, but had to take an oath. Rocio distinctly remembers an officer telling her, “if you ever commit a crime, you’ll have to be deported.” The whole process of becoming legal took about five years. Since Rocio was still quite young she does not have the clearest memory of her time in New York, but remembers the recurring feeling of confusion. She started school as a kindergartener and remembers this from the certificate they gave her saying she graduated. She then moved on to first grade at a Catholic school. The nuns there would always make her walk up in front of the whole class and recite her name. She had no idea why they would make her do this, but did as she was told so she would not be slapped on the wrist. During her time in New York she felt like she was standing still, watching the world go by without knowing what was happening. She did not understand their rules or their language but tried because she had to. Learning English was not an easy thing for Rocio. She had never been taught English before, so after school her mom told her she needed to go to a lady’s house to get help. Her brother was still too young to go so she went by herself. Each day as she practiced her English the lady would give her a cookie and some sort of dark drink. Rocio had never had it before and felt embarrassed for not knowing the name, so she kept sipping peacefully. Rocio did not find out until having a kid of her own what that dark drink really was. A fellow parent recommended Rocio try grape juice out on her daughter. When she tried it for herself she recognized that taste as the same drink the lady used to give her. Rocio’s mother was an artist and her father was a guitarist. He was a very talented musician and his job was the main reason for their family’s move. Her Aunt was the one who bought her father his first guitar. Her family claims that her dad picked it up and immediately knew how to play and since then his talent only grew. A very famous guitarist, Andrés Segovia, was living in New York at the time and would come to Rocio’s apartment to give her dad lessons. They grew so comfortable with each other that Rocio started calling him Papa Segovia. Throughout her time living in New York her parents would argue quite often. Rocio was unaware of the cause of conflict between them, but the arguments continued. When Rocio was in second grade her parents split up and she moved out of the United States to Puerto Rico at the age of seven, which ended her time spent growing up with her mother. When she arrived to Puerto Rico the feeling of confusion and lack of understanding went away. The English that her class was learning felt so much easier to her compared to the level they were at in New York. She would pick up the books they were given and realized she already knew the words in them. She could read and write English better than all the other kids in her class and she even began to make friends. She was back in a place that she felt comfortable in where things actually made sense. She built a life in Puerto Rico until she was thirteen and had to move back to Mexico City for her father’s work and to be closer to his family. During this time her father met and fell in love with another American woman. Once again Rocio was forced to pack up her life and move to Arizona where her stepmom’s mother lived. By this time Rocio had attended eleven different schools before she even entered high school. During her time in Arizona her dad received a huge job opportunity. Rocio’s uncle was a journalist attending the World Fair in Texas and got her father a chance to play. Her father had such a good reception at the World Fair that he was invited back. This was the start to his attempt at rising to fame. This was when her father decided to make the move to Texas. He was always performing there and teaching guitar workshops so it just made sense for them to move. It was at this point that Rocio refused to go with them. Her stepmom and dad were already having problems in their relationship and she was fed up with being forced to follow them everywhere. Rocio now had to support herself living alone in Arizona, so she got a job at a park teaching dance and slimnastics. 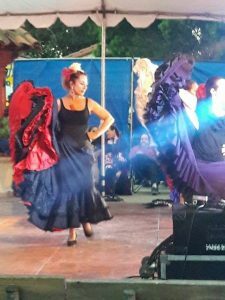 Her family has a huge history with Flamenco, a popular Spanish dance, and she used to be a gymnast, so it was something that came naturally to her. Rocio enjoyed her job and the company of the older ladies that would come to be active and get in shape. Rocio worked with a woman named Mae who had children of her own that were all off to college during the time. She offered Rocio a room to rent from her until she graduated high school. Rocio started high school in America when there was still influence of the hippie movement and she was accustomed to it. She was surrounded by kids wearing torn clothes with hunched backs that walked around barefoot. She was used to a school where they wore uniforms and cared about their education, grades, and appearance. Her impression of these American kids was that they were stupid and liked being stupid. Where she was from stupid was the last thing you wanted to be. She thought these American kids took their learning and how they looked as a joke. It was hard for her to make friends anyway since she would work everyday after school. Most of the kids she went to school with did not have to support themselves. Rocio did make one friend that left an impression on her. It was a girl that sat behind her in one of her classes that she would turn around and talk to sometimes. She was a Native American from the reservations that decided not to attend the schools that they had there. For Rocio her new friend was someone she could relate to. It was someone that knew the feelings she was having and going through the similar struggles of adjusting and fitting in. The day that her friend left, Rocio assumed back to the reservations, she gave her a silver ring that Rocio still has to this day. Rocio was glad to be away from all this to focus on her own American Dream. In High School, Rocio took a state test that placed her in all advanced classes. This was hard for Rocio because she could barely even understand what the teachers were saying. She was taking Advance Composition where she had a teacher named Mrs. Campobello who was originally from Italy and struggled with similar problems as Rocio. Mrs. Campobello told Rocio that she knew what her problem with English was. She worked with Rocio extra until she got the hang of it. It was people like this that made Rocio’s transition just a little bit easier. Mae, the woman who took Rocio in, motivated her to go to college. She envisioned Rocio to be a secretary, so she took a typing class, which ended up helping her quite a bit in college. Rocio attended the Grand Canyon College in Phoenix Arizona and pursued her work in Dance. To this day Rocio still teaches dance and now Spanish, living with her daughter Manoli in sunny San Diego, California. The interview and story about Rocio Guillermoprieto was done by Lauren Zenger, a student at Palo Alto High School.